Sports betting is an extremely popular pastime in the United Kingdom. Some of the world's biggest bookmakers are based in the UK and offer online and mobile betting on soccer, golf, rugby, tennis, darts and football. The United Kingdom is home to some of the largest and oldest bookmakers in the world. Walk down any high street and you'll see a Ladbrokes, BetVictor or William Hill betting shop on every corner. The British have a long and well established history when it comes to sports and horse race betting, so it should come as little surprise that they also lead the way when it comes to mobile betting technology for iPhone, Samsung Galaxy, Nokia Lumia, Blackberry and HTC. The Brits are fanatical about sports. The English and Scottish Premier Leagues are two of the biggest sporting institutions in the UK and are home to global names like Manchester United, Liverpool FC and Glasgow Celtic. The UK also boasts some of the best rugby and cricket teams in the world. In recent years Andy Murray has won the Wimbledon tennis championship, while Bradley Wiggins became the first Brit ever to win the Tour de France. Let's not forget that London was also home to the Summer Olympics in 2012. In a country so passionate about sports, it's not surprising that there is also a big interest in wagering on these various sporting events. Many of the UK's top bookmakers now offer provide their customers with apps that work on iOS, Windows Phone and Android handsets. These bookie apps offer in-play betting, live scores and results, team news, betting tips and live streams of hundreds of sporting events every week. With such a diverse selection of betting apps, choosing a single one can be a daunting task. To help make the selection process a little easier, we've thoroughly tested each app and come up with the following short-list. Bet365 are a UK based online bookmaker that has quickly grown in popularity thanks to its ground-breaking sports betting app. 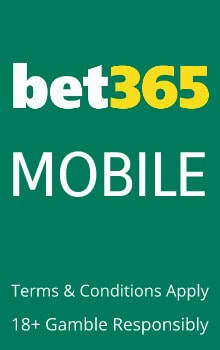 Bet365 were the first bookie to stream live sports like darts, soccer, NBA basketball and tennis to iPhone and Android devices. The app also features an audio section where you can listen to live commentary of horse racing, greyhound racing and football matches from the English Permier League, La Liga, the Champions League and more. 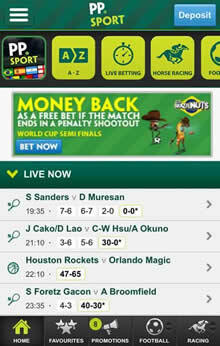 The Bet365 "Match Live" feature allows sports fans to follow all action of a match through a visual representation of the games on their phones. Sports covered include soccer, baseball, cricket, handball amongst others. You can see a visual representation of the playing field, along with info on possession, corners, fouls, free kicks, throw-ins and every other conceivable stat you might need for live in-play betting. Even though Paddy Power are an Irish company, they have quickly become one of the United Kingdoms favourite bookmakers thanks to their cutting edge mobile software. Almost half of all mobile sports bets placed in the UK are from either a Paddy Power Android or iPhone app. With PaddyPower Mobile you can quickly browse the "Top 10" most popular bets at any given time to monitor betting trends. Set your home team to create customised team pages with all the latest news, fixtures, results and odds. Click on the "Promotions" button to get a full list of every PaddyPower offer and money back special. The "Coupons" page allows you to play the football pools by predicting results from a variety of leagues. Horse racing fans can watch live racing from racetracks in the UK, Ireland, Africa and America. PaddyPower have also developed a tablet version of their award-winning app specifically for the Apple iPad. Mobile Betting Technology in the U.K.
Sports betting has a long history in the United Kingdom dating back many hundreds of years. There are now over 8,000 betting shops scattered throughout England, Scotland and Wales. Only Bingo, another British institution, is more popular. In recent years many of these high-street betting shops have gradually started to close as the UK's citizens made the transition to internet sports betting. Many bricks-and-mortar bookies closed because they simply couldn't compete with the bigger online operators. Internet sports betting was successful in the UK for a number of reasons. Firstly, online betting sites had far lower overheads so they were able to offer their customers better odds on football, horse racing, rugby and other major UK sports. Online bookmakers also succeeded in luring new customers by offering them incredible free bet offers and bonuses. It should also be remembered that a large percentage of the British population live in rural areas so they weren't able to pay a quick visit to the nearest Stan James, Ladbrokes or William Hill. Thanks to the PC these sports fans were finally able to wager on Arsenal, Tottenham Hotspur or Glasgow Rangers at the weekend. Over the past number of years, online bookmakers have started to slowly see their customers make the move from their online website to their mobile apps. The ubiquitous nature of smartphones like the iPhone, Samsung Galaxy S, Motorola Droid and Sony Xperia meant that bookmakers gradually began to devote more of their resources to developing technologically advanced and feature-rich betting apps. While many people believe that the BlackBerry was the first smartphone, in our opinion it all started with the first iPhone. Until Apple introduced the touchscreen, handheld devices were little more than calculators you could make phone calls on. The iPhone's large touchscreen display meant you could surf the web in the same way that you would from your desktop PC or Mac. Sports fans quickly began checking bookmaker websites to get the latest odds on Rory McIlroy winning the British Golf Open or to have a punt on the Aintree Grand National. Online bookies noticed this trend towards mobile and quickly set about developing mobile sites that were easy to navigate from the iPhone. These early iOS compatible sites were extremely primitive and only offered betting lines on major UK sporting events like the Cheltenham Racing Festival or the F.A. Cup Final. Despite this they proved extremely popular, which encouraged the gambling companies to continue investing in their mobile software applications. As a result, modern bookmaker apps now provide news, live scores, fixtures, league tables and sports betting tips. From your iPhone or iPad you can also watch Phil Taylor win another title in the World Cup of Darts or see Jessica Ennis win gold for Team GB in athletics. Apple revolutionised the world of mobile gambling again a few years later when they introduced the iPad. While iPad users could browse regular website if they wished, many users had grown accustomed to the easy of use and speed associated with iPhone apps. Because of this, many online sportsbooks began developing tablet specific apps to fully utilize the iPad's 9.7-inch screen. United Kingdom sports fans would now watch the English cricket team compete in The Ashes in high-definition on their iPad. Due to the extraordinary success of the iPhone, Google decided to develop their own mobile operating system call Android. They licensed this OS to phone manufacturers who in turn released popular devices like the Samsung Galaxy Note, Motorola Moto, LG G Flex and the Sony Xperia Z1. UK bookmakers quickly released Android-compatible betting apps that offered a range of mobile sports wagering options. Since Google have banned real money gambling apps from Google Play, Android users will need to access them from the Chrome browser of their tablet or smartphone. Android devices were cheaper than their iOS counterparts, which meant that a whole new generation of smartphone users was born. Online bookmakers in the United Kingdom quickly rolled out a range of Android friendly sports betting apps that also included horse race betting tips, live updates on the Barclays Premier League and live streams of snooker matches featuring English legends like Ronnie O'Sullivan and John Higgins. For many years it looked like a two horse race between iOS and Android in the battle for mobile supremacy. Few would have guessed that Microsoft's Window﻿s Mobile/Windows Phone would quickly overtake BlackBerry to become the third most used smartphone OS in the world. Popular brands include the Nokia Lumia 910, Nokia Lumia 1520 and the Microsoft Surface Tab. However, you won't find any casino, poker or sports betting apps in the Windows Phone App Market. Instead you'll need to install gambling apps on our Windows Phone via the browser on your device. Although answers may vary slightly depending on which type of smartphone you are using, most of the Q&A section below will be relevant to iOS, Android, Windows Phone or Blackberry betting sites. Can I download bookmaker apps from the iTunes App Store? If you live in countries like the United Kingdom, Ireland or Australia, you will find major bookmakers like Betfair, Coral, Betfred, and PaddyPower listed in the iOS App Store. If you live in the United States, you will need to use one of these web-apps. How secure and fair are UK based sports betting sites? UK betting sites are licensed and regulated by the Gambling Commission so they are extremely safe. They regularly audit commercial gambling operations in Great Britain to ensure that they are complying with their strict code of conduct. I cannot access gambling websites on my phone in the UK. What is the problem? Some networks like Vodafone and 02 use filters that automatically block websites with adult content, including online casinos, poker rooms and sportsbooks. Providing you are over 18, you should contact your network provider to have the filter removed.